There is SUCH juicy-ness in exploring the mystery, complexity and depth of the feminine* and of being a woman! And, it can also be scary at times, because great power dwells in us. *’The feminine’ exists within both men and women and within life. I support women to explore this aspect of themselves. We have so many layers and aspects of ourselves that we label; dark, light, good, bad, shadow, sweet, nice, selfish, etc. Our ‘shadow’ parts hold huge power and contain another layer of who we are. Yet it’s often this part of ourselves that we avoid, because we’ve been ‘taught’ that it’s better (more acceptable) to be a sweet, nice, pleasing woman (Grrrrrr). Much of our mystery, complexity and depth is related to our female body cycles, which include our menstrual cycles. During the different phases and stages of the cycle, different aspects of our characters are more prominent and are revealed. In WW workshops or classes, we explore what visibility feels like in these different phases, and the parts of our characters that emerge, some of which feel much more vulnerable than others. Retreating into an internal, silent cave is often not about hiding at all. It’s actually necessary for rest and regeneration. Staying there permanently, is an entirely different matter! 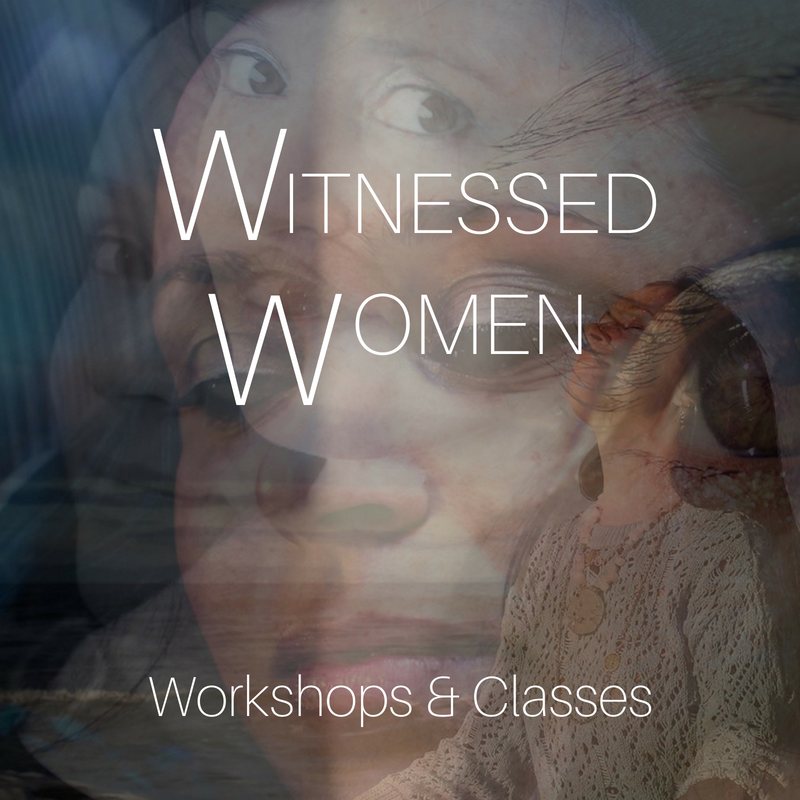 Witnessed Women classes and workshops are for women who are more than ready to shine and to explore being witnessed in the truth of who they know themselves to be. When you are witnessed in your authenticity, you can have more courage to show up just as you are. There are so many women holding back their gifts because they are afraid to be seen, to show up in their lives in their ever changing mystery, depth and complexity, to own their greatness, their wildness, softness, vulnerability, sexual aliveness, fear, shyness, power, gentle tenderness or anger, their humanity and divinity. In their wholeness. WW workshops have a specific focus to create a sacred and safe space in which we can show ourselves. Through practices that connect us to our deep feminine essence, we begin to know ourselves on a much deeper level and from different perspectives. Force can do long-term damage. Stretching ourselves too much, too soon, all at once from a place of frustration or anger at ourselves for not being more than…better by now…can actually cause us to snap, like an elastic band that’s been stretched too far. It’s a delicate dance to know when we are deliberately (consciously or unconsciously) hiding, holding back or avoiding challenging situations that can help us to grow, and being aware of when we need personal space to rest, rejuvenate or develop or that the timing isn’t right for something. This is the ‘edge’ that we want to access because, when we live from this space, we can feel truly and fully alive. As women, we often also need gentle guidance to blossom and bloom into our full womanhood. To explore our deep essence and most natural self. We need to find that ‘sweet spot’ and to know the intimate dance between our creative edge and our need to retreat, let go and soften. This is the masculine, feminine dance that is related to the phases of our female cycles. WW workshops are a place where we can feel safe and supported stretching and peeling back the layers of armour to reveal our luminescence. It’s often inner beauty, power in all it’s expressions and magnificence that women feel the most afraid of showing – we can become habitual in the way we show up, used to hiding, shrinking or diverting attention. We can feel like little prawns; soft, tender and delicate on the inside, with a hard shell on the outside. We explore when this ‘shell’ is a good thing that creates boundaries and protects this tender and beautiful centre and when we are hiding within it. This is a space to gently unfold into experiential and embodied knowing of fully showing yourself and all of the feelings, thoughts and sensations that arise in this place. This can often take time, as we honour and respect our own needs, boundaries and become aware of our zones of comfort. In the WW workshops, we practice showing up in our wholeness with all the flavours of ourselves present in the moment and often hiding just beneath the surface. We experience what it’s like to be real and acknowledge truths about the truth of who we really know ourselves to be. We move beyond mind-based perceptions and into the heart and soul of who we really are. We receive heart-felt and compassionate feedback about how we are perceived by other women. We allow ourselves to flourish fully into our wholeness and discover layers and depth we were not fully aware of or had not acknowledged. We can feel utterly full and learn how to receive healthy attention and how ‘letting it in’ affects your body and physiology. We need the courage to bring ourselves, our voices, gifts and work into the world and to infuse more of the feminine qualities of sensitivity, compassion, intuition, creativity, love and tenderness, present within men and women, into our world. I’ve created something that I wish I had growing up as a super-sensitive, intelligent and creative young woman with an incredibly rich inner world. WHO IS WITNESSED WOMEN FOR? In a nutshell, for women who are a bit to a lot sacred of their own power. And, for women who have a good idea about who they really are, but for a multitude of reasons, are not fully being that. WW is for women who know they have wisdom to share, and that there is an inner power that is not fully realised yet, it’s for women who may have prolific creative ideas, thoughts, things to say, AND who are also highly sensitive, creative souls, intuitives, multi-passionate women, artists, more introverted than extroverted, tender, sensual souls, intelligent women who have tendencies to hold back, keep quiet and hide, but who hold the desire to show up as themselves and express through their creative work (and creative life!). WW is for women who have rich inner worlds, who wish to bring their depth of being into alignment with who they show up as in the world. It’s for women who have something to say in the world but don’t fully say it. And it’s for women who want to ease into exploring and sharing their true, tender, fierce, powerful, vulnerable selves – their WHOLE WOMAN. If you don’t feel that you ‘fit in’ to any of these descriptions but feel drawn to come, you are most welcome. Host’s benefit in wonderful ways! Goodies, free participation, discounts and more are all part of the package if you choose to be a host for a workshop or retreat. If you feel called to host a workshop or retreat in your community, Contact me and we can have an initial chat about possibilities! I also host Language of the Feminine Expressive Arts workshops which can be combined into longer retreats with Witnessed Women. We need both of these workshop formats (which is why I created them) to be able to access our creative, intuitive and sensual energy and find our creative expression, and then to be witnessed in that and share it, if it is a true desire to do so. A powerful format for freeing our creativity and exploring who you are and who you want to become.